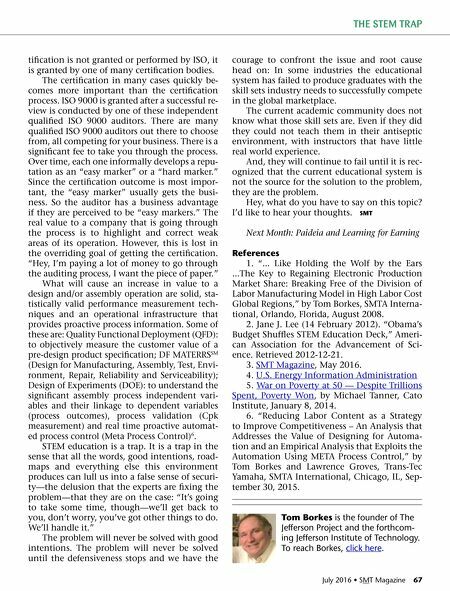 July 2016 • SMT Magazine 67 THE STEM TRAP tification is not granted or performed by ISO, it is granted by one of many certification bodies. The certification in many cases quickly be- comes more important than the certification process. ISO 9000 is granted after a successful re- view is conducted by one of these independent qualified ISO 9000 auditors. There are many qualified ISO 9000 auditors out there to choose from, all competing for your business. There is a significant fee to take you through the process. Over time, each one informally develops a repu- tation as an "easy marker" or a "hard marker." Since the certification outcome is most impor- tant, the "easy marker" usually gets the busi- ness. So the auditor has a business advantage if they are perceived to be "easy markers." The real value to a company that is going through the process is to highlight and correct weak areas of its operation. However, this is lost in the overriding goal of getting the certification. "Hey, I'm paying a lot of money to go through the auditing process, I want the piece of paper." What will cause an increase in value to a design and/or assembly operation are solid, sta- tistically valid performance measurement tech- niques and an operational infrastructure that provides proactive process information. Some of these are: Quality Functional Deployment (QFD): to objectively measure the customer value of a pre-design product specification; DF MATERRS SM (Design for Manufacturing, Assembly, Test, Envi- ronment, Repair, Reliability and Serviceability); Design of Experiments (DOE): to understand the significant assembly process independent vari- ables and their linkage to dependent variables (process outcomes), process validation (Cpk measurement) and real time proactive automat- ed process control (Meta Process Control) 6 . STEM education is a trap. It is a trap in the sense that all the words, good intentions, road- maps and everything else this environment produces can lull us into a false sense of securi- ty—the delusion that the experts are fixing the problem—that they are on the case: "It's going to take some time, though—we'll get back to you, don't worry, you've got other things to do. We'll handle it." The problem will never be solved with good intentions. The problem will never be solved until the defensiveness stops and we have the courage to confront the issue and root cause head on: In some industries the educational system has failed to produce graduates with the skill sets industry needs to successfully compete in the global marketplace. The current academic community does not know what those skill sets are. Even if they did they could not teach them in their antiseptic environment, with instructors that have little real world experience. And, they will continue to fail until it is rec- ognized that the current educational system is not the source for the solution to the problem, they are the problem. Hey, what do you have to say on this topic? I'd like to hear your thoughts. SMT Next Month: Paideia and Learning for Earning References 1. "... Like Holding the Wolf by the Ears ...The Key to Regaining Electronic Production Market Share: Breaking Free of the Division of Labor Manufacturing Model in High Labor Cost Global Regions," by Tom Borkes, SMTA Interna- tional, Orlando, Florida, August 2008. 2. Jane J. Lee (14 February 2012). "Obama's Budget Shuffles STEM Education Deck," Ameri- can Association for the Advancement of Sci- ence. Retrieved 2012-12-21. 3. SMT Magazine, May 2016. 4. U.S. Energy Information Administration 5. War on Poverty at 50 — Despite Trillions Spent, Poverty Won, by Michael Tanner, Cato Institute, January 8, 2014. 6. "Reducing Labor Content as a Strategy to Improve Competitiveness – An Analysis that Addresses the Value of Designing for Automa- tion and an Empirical Analysis that Exploits the Automation Using META Process Control," by Tom Borkes and Lawrence Groves, Trans-Tec Yamaha, SMTA International, Chicago, IL, Sep- tember 30, 2015. Tom Borkes is the founder of The Jefferson Project and the forthcom- ing Jefferson Institute of Technology. To reach Borkes, click here.